I support Democrats Abroad because it gives Americans abroad the opportunity to become politically activated and exercise their civic duty as citizens. The Democrats Abroad mission is key to keeping Americans involved, educated and motivated about American politics and civic engagement. NOW is the time to call your Senators and tell them this bill CANNOT PASS. The Senate will vote on the bill in the coming week. Call your Senator directly or else 1-202-224-3121 via Skype or your cell phone. Urge them to commit to vote against any bill that will result in anyone losing coverage. Urge them to commit to vote against any bill that does not guarantee people with pre-existing conditions will not see higher premiums. Urge them to vote against to any bill that eliminates funding for Medicaid. If possible, follow-up your call with an email to your Senator. We can defeat this mean, hateful and harmful legislation. It will only take a few minutes of your time. CALL NOW. 1-202-224-3121. The Milan chapter is proud to announce its participation as an official sponsor for 2017 #MilanoPride! Democrats Abroad stands with the#LGBTQ community’s fight for equality. Join the Democrats Abroad Milan Chapter to march, smile, dance and be proud of being you! Gay, straight, lesbian, bi, transgender, queer, or anything and everything in between, ALL are welcome to march proud with us, so feel free to spread the word and invite others! 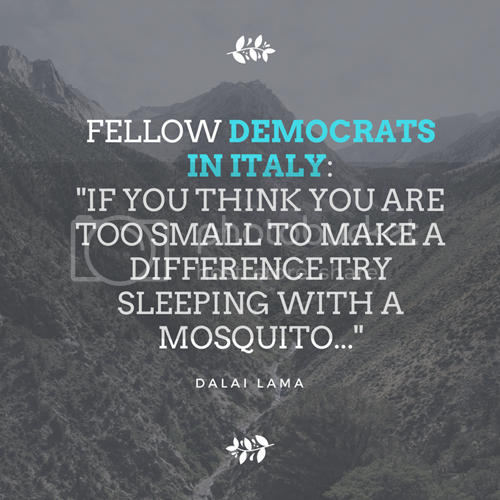 We will meet at 2:30 pm on Saturday June 24th in front of the Piazza Duca D'Aosta (Stazione Centrale) Look for the people waving Democrats Abroad posters! The parade departs from Piazza Duca D'Aosta and ends in Porta Venezia with a benefit concert. See our Facebook event here. P.S. Bring some cash because we will have the very latest design resistance t-shirts in various colors as well as buttons and flare for sale at the parade as well! Democrats Abroad stands with the LGBT community’s fight for equality. 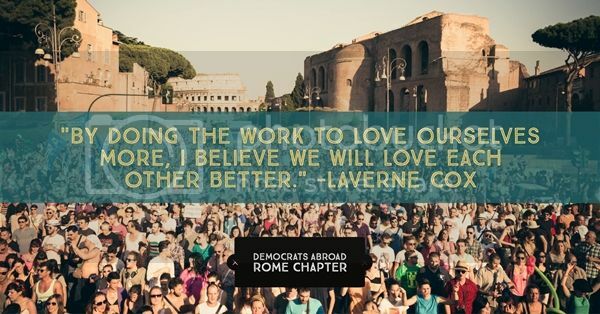 Join the Democrats Abroad Rome Chapter to march, smile, laugh, dance and be proud of being you! We will meet on Saturday, June 10th at 3:30 pm in front of the Space Cinema in Piazza della Repubblica (Piazza della Repubblica 43/45, 00184, Roma). The parade departs at 4:00 pm. Gay, straight, lesbian, bi, transgender, queer, or just plain human, ALL are welcome to march proud with us, so feel free to spread the word and invite others! At the end of May, The President travels to Saudi Arabia, Israel, Italy, and Belgium. These past months, he has caused outrage all over the world: he is dividing and excluding people; he is denying climate change and intimidating the media; he is phasing out solidarity. Democrats Abroad is happy to announce that we will be co-hosting a protest with AEPC and Womens March Rome to not only denounce the horrible policies that the current administration is pushing for but to also state loud and clear that we stand united #UnitedWeStand for #ImmigrantsRights, #WomensRights, #HumanRights, the #Environment, #Healthcare #FreedomofReligion #FreePress and #Democracy. Protesters in Rome will meet on May 23 at 19:30 in Piazza Bologna. DA Italy Executive Committee Member (Counsel), Michael Stiefel will be representing DA Italy as contact for members planning on participating. We will be covered by several media outlets including CNN! We cannot keep quiet and we invite US Citizens, Italians and all global citizens to come together to make some noise. 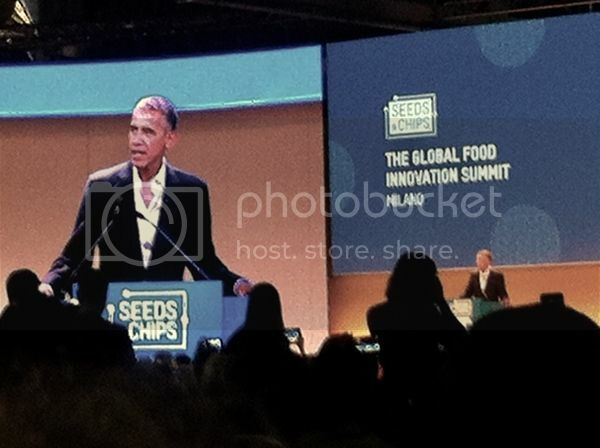 On May 9, Barack Obama spoke in Milan at the Global Food Innovation Summit, and eight members of Democrats Abroad were fortunate enough to be in the auditorium (with 2,000 other people). 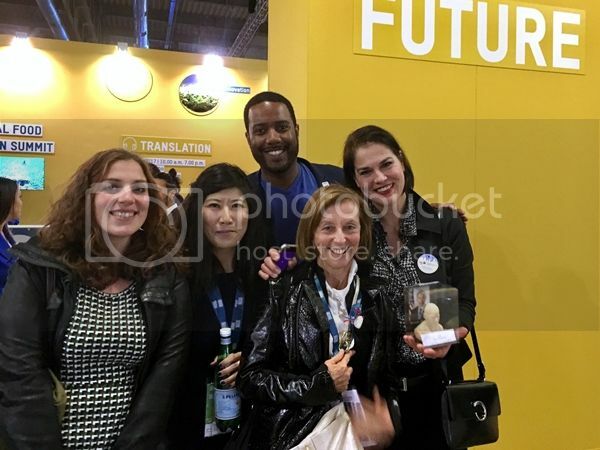 Past and present DA-Italy leaders Ginger DiGaetano, Claudia Flisi, Theresa Morelli, and Ryan Turner* were in attendance, as were Italy members Laurel Evans, Amie Louie, and Vicki Satlow. Evelyn J. Kim, a member of DA-Denmark was also present. This was President Obama’s first time in Italy since leaving the White House, and the media covered his appearance as if he were a rock star. So did the audience, which gave him a boisterous standing ovation as he arrived on stage. He spoke knowledgeably for about 20 minutes on food and climate change. Then he and his former White House chef Sam Kass sat down for an hour to discuss this theme in more detail, plus the Paris Agreement, the nature of leadership, the impact of technology on food, work, and world security, the politics versus the science of GMOs, the importance of “climate-smart eating habits”, the pros and cons of industrial farming, the role of the private sector in agriculture, and why he and Michelle hope to come back to Italy “often” in the future. ...history does not move in a straight line but rather zigs and zags before progress can be achieved. The optimism that welled through the hall when Obama finished was palpable. DA – Italy is optimistic that both Obamas will return soon and inspire all our members to bend the Democratic arc to justice, starting with the midterm elections of 2018. 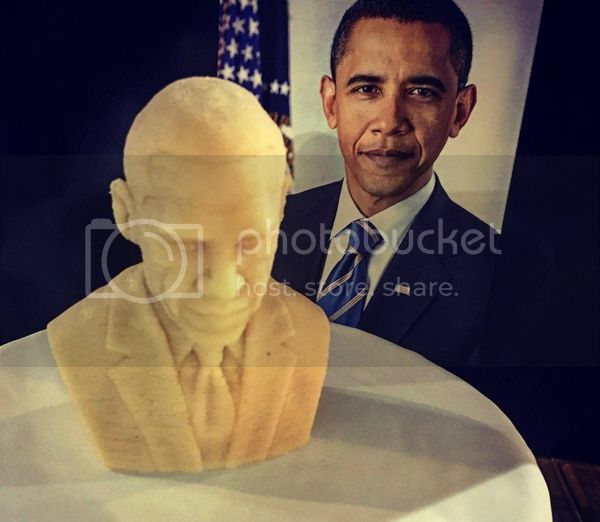 • 3-D food printer Bocusini for donating a delicious marzipan bust of Obama to Democrats Abroad (see below). It will be up for auction at DA-Milan’s upcoming wine-tasting event on May 27, so you can taste Obama’s visit without having been there. • Stefano Caccavari, founder of artisanal mill Mulinum, for his generous assistance to DA-Italy at the Obama event. * Ginger DiGaetano is current vice chair of DA-Italy. Claudia Flisi is a past chair and vice-chair of DA-Milan. Theresa Morelli founded the DA-Milan chapter and is former DA-Milan and DA-Italy chair and is currently DA-Milan co-chair. Ryan Turner is current chair of DA-Italy. Article Credit: Claudia Flisi, former DA Milan chair. 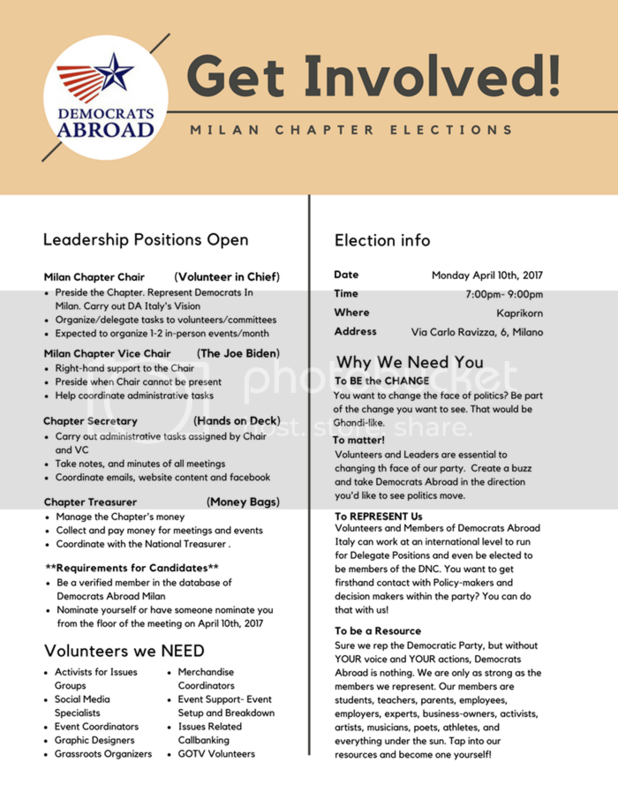 Democrats Abroad Milan Ushers in New Leadership! 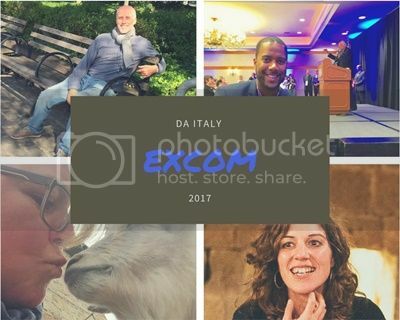 Our board will promote growth and work actively work to increase our membership in preparation for the crucial 2018 GOTV efforts and we will increase the amount of events and activities to connect and engage members in person, in Milan and Northern Italy. The Co-chair combination reflects Theresa’s longstanding experience in Democrats Abroad as the founder of the DPCA’s first Country Committee with multiple chapters, when Theresa founded and chaired Democrats Abroad Milan, then Democrats Abroad Italy, and served on both the DPCA Executive Committee and the DNC as a Super-Delegate. 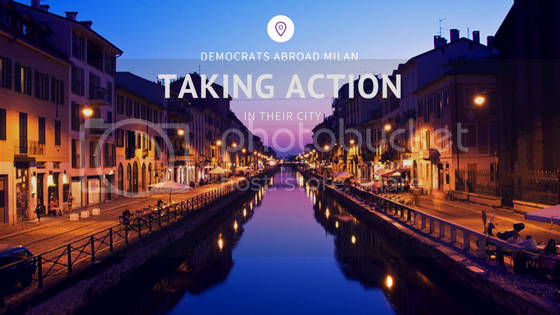 A long-serving political activist and renowned community advocate in Milan she looks forward to bringing Democrats Abroad Milan and its many talented and fired-up members to enthusiastic participation and active expression in the forefront of Milan! Nancy is a true blue democrat who totally embraces the ideals of the democratic party, she has lived in Italy for 30 years. She is consumed with enthusiasm to create exciting events to show case Democrats abroad and increase the membership to create a vital turn around for the 2018 elections. The time is ripe and so many people share our shock , horror and concerns. Our job is to harness the incredible energy of the Resistance Movement and to impact our elections in 2018 through GOTV efforts as much as possible. As a group we will be able to enrich our strengths and passions to make a lasting mark. "Our job is to harness the incredible energy of the Resistance Movement and to impact our elections in 2018 through GOTV efforts as much as possible." Secretary, Mike Waite is originally from the proudly Democratic city of Boston and has been involved with Democrats Abroad for over 7 years. As an intern for DA Munich in Germany Mike launched their Facebook page and was active in reaching out to members and coordinating events. Now living in Parma, Mike is excited to bring his experience to the position of Secretary of the Milan Chapter and to get our message out and rally supporters to ensure Democrats win in the next mid-term and presidential elections! 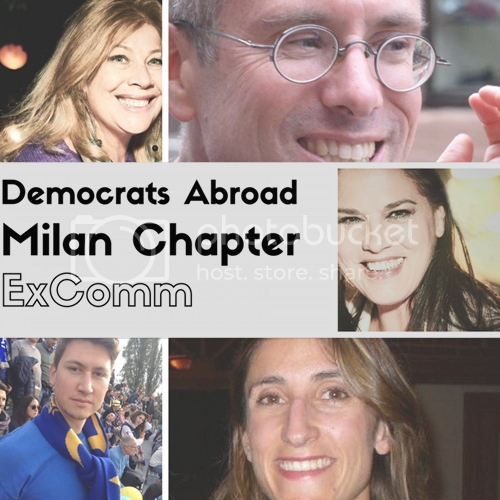 We are joined by Sean Carlos (vice chair) and former Chair, Astrid Palmieri as (treasurer) both who share our democratic values and dedication to make Democrats Abroad Milan a thriving chapter leading with Democratic spirit and collective action. Our greatest desire is to connect with like minded Americans and harness the energy of democratic values to create a vibrant chapter where all may contribute to bring about a positive change in the 2018 elections. Take Action! Make your voice heard! We need to defend our planet from the encroaching threat of climate change. There has never been a more critical time to engage on environmental issues. Science, scientists, and evidence-based policymaking are under attack. Censorship of researchers, disappearing datasets, and threats to dismantle government agencies harm us all—putting our health, food, air, water, climate, and jobs at risk. It’s time for people who value science to make their voices heard right here in Italy! 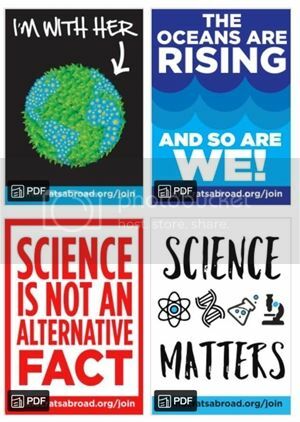 This Saturday, April 22nd, Democrats Abroad Italy is taking part as an official Sponsor of the March for Science Italy campaign. 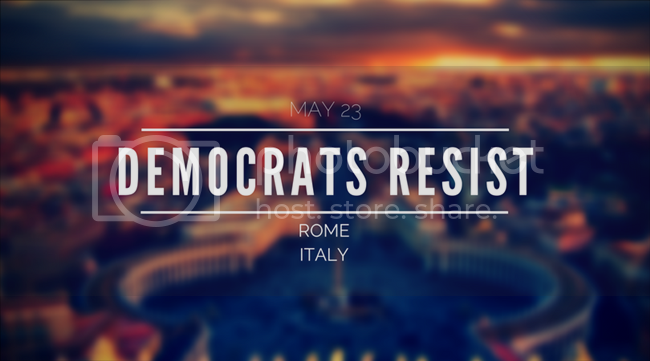 Democrats Abroad Italy will participate in marches in Rome, Milan and Florence. We have organized facebook events in each our chapter cities for our members to take part. *Not a march, but a Teach-in, Democrats Abroad Italy member, Joanne Maloney will be speaking with University Professors on taking political action from abroad! This is a global movement! Be one of millions around the world defending science and its importance in our politics. This Saturday, on Earth Day, tens of thousands will March for Science in Itay and around the world. They march to celebrate science, its importance to each of our lives, and its critical link to politics. GET INVOLVED! Earlier this week, President Trump signed a new Executive Order rolling back the Clean Power Plan​, an Obama initiative to ​limit greenhouse-gas emissions from existing power plants. ​This action will make it nearly impossible for the U.S. to meet its Paris Climate Agreement commitments to cut greenhouse gas emissions by 26-28% by the year 2025. The new Executive Order comes two weeks after President Trump’s proposed budget slashed funding to the EPA by 31%, more than any other government agency. Cuts to the EPA would cripple the agency’s ability to regulate the pollution by corporations of our air, land and waterways. It will destroy thousands of jobs across the country, harm the health of Americans, and slow the growth of clean energy like wind, gas and solar, while propping up industries that are no longer economically competitive. ​We all need to raise our voices in opposition to these destructive actions that will impact the health of our planet and the lives of current and future generations. ​Please take a few minutes to all or e-mail your Representative/Senators and the White House and tell them that protecting the environment matters to you and is a vital national priority​. Apps and websites like https://hearmyvoice.com/ make it SUPER simple to contact your elected officials via, phone, email and social media instantaneously on a variety of issues. There are plenty of ways to make your voice heard! The White House comment line is 202-456-6213. We are honored to have been elected as the new Executive Committee,and to be counted among the fresh, bold, and progressive leaders in the DPCA leading GOTV efforts and Country Committees around the globe. We will promote growth and work towards creating sustainable chapters and Country Committees that will grow organically and continuously. We will actively work to increase our membership in preparation for the crucial 2018 GOTV efforts and we will increase the amount of events and activities to connect and engage members in person, across Italy. We are in a pivotal moment in our history, and we must continue to build on the momentum of the incredible resistance that has begun to form into a true movement. We cannot stand idly by as waves of activism sweep the globe but we must instead be part of the action and bring our considerable resources to the fore. The movement is just beginning, and our work of recruiting Americans to support the Democratic platform and vote in elections is our great contribution. We will need everyone to pitch in as part of DA Italy, in any way that we can. If you are interested in running for a post in your local chapter, volunteering to hold an event, or help to organize meetups, we need your helping hands. Contact us directly via email, Facebook or Twitter to find out how you can volunteer, and know that every little bit helps, and is appreciated. We need to harness the spirit of service and our collective action not only to defeat the current administration but to preserve the robust democratic process that makes our organization, and the institutions it represents, so vital. As members of the Executive Committee, we offer our time, our energy, and our belief that progress comes through action, and that together we will continue to protect these values and build a sustainable path forward. DA Madrid- Debate Viewings: Essential in Informing Voters Abroad! 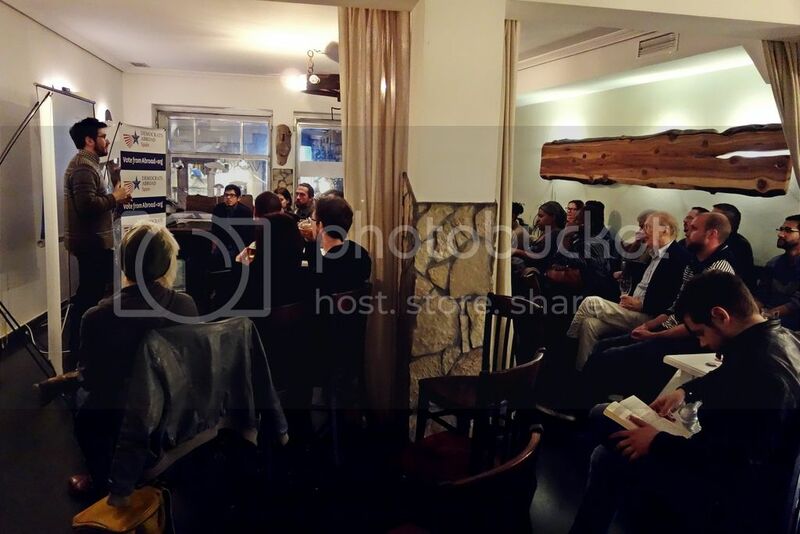 The Madrid Chapter of Democrats Abroad has made it a priority to show each and every Democratic Primary debate since they began 5 months ago. These debates help inform voters about where our candidates stand on the issues and were essential in helping voters around the globe decide which candidate to support in our Global Presidential Primary. Last night, Madrid Secretary, Mike Presiado hosted the 8 edition of #MikeysElectionCorner and it was a huge success. We are looking forward to more robust debates and hosting similar viewing parties for the National Presidential debates against the republican party in the near future! To add even another level of interest and excitement to our Black History Month Event this Sunday Feburary 21st, we will also be participating in the Global Town Hall, an opportunity for both the Clinton and Sanders campaigns to field questions from Americans living abroad. We will be incorporating our event into the Global Town Hall by asking the campaigns questions regarding race and Black history. - Jake Sullivan, Hillary Clinton's top Foreign Policy Advisor, will join us from the Clinton campaign. Mr. Sullivan served as Secretary Clinton’s Director of Policy Planning at the State Department. He also served as Vice President Joe Biden’s National Security Advisor and was a main architect of the Iranian nuclear talks. - Bernie Sanders has yet to confirm the exact person who will be speaking with us. So start thinking of questions you want to ask the campaigns, and join us on this Sunday! Check the event out on our Facebook page as well! Chair of Democrats Abroad Italy @berniesanders pledged delegate for @demsabroad to the 2016 Democratic National Convention in Philadelphia. IR Professor and Silly Goose. Opinions are my own.